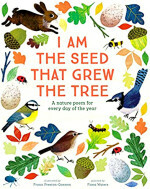 A very big book of nature poems for every day of the year, this is as much a picture book as a poetry anthology, with beautiful illustrations adding a magical touch to some lovely verses. Poems ancient and modern include gems by current writers such as John Agard, Jan Dean, Roger McGough, Tony Mitton and Roger Stevens. Emily Brontë, Emily Dickinson, Edward Lear, Christina Rossetti, Tennyson, Shakespeare and Yeats are a few of the many poets from days gone by. And there is a smattering of traditional rhymes as well. All together they make a lovely collection of poetry through the ages. I have detected a bit of a trend toward big, hardback poetry books recently, perhaps reflecting the fact that more people are reading – and valuing – poetry now, than for a long time. Hurrah! While easy-to-read cheap paperbacks make poetry accessible to all, there is definitely also a place for the more durable ‘special’ book to be kept as a family treasure and to pass on to the next generation. This is one of those.